A semi-unique British Lovell's lug bayonet. This example shows a 17" blade and a 3" socket. This bayonet is the 1842-1851 era , built by a number of contracters. British WW2 Machete, one of the lesser variations. 13 1/2 " blade marked GOF, 1945 date. An interesting variation of the No. 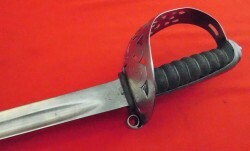 An excellent example of an India pattern bayonet (3rd Model Brown Bess). This piece shows a very good plus blade, 17" and overall 21.75. The blade and socket show light pitting and staining. Brown Bess relic bayonet . No markings, overall pitting. This piece was purchased by the prior owner as a battlefield pickup in Europe. We have no information beyond that. A neat relic bayonet. An excellent hand tooled Finish knife sheath built for a 5" blade. -Overall this piece is 9" and remains in very good to excellent condtiion. British household cavalry sword pattern 1892 (Mark 1). A Kris probably from Java. This knife is 17" overall and shows a 13" double-edged blade. The blade is welded Damascus & shows its' obvious age circa 19th Century. WW1 German 598/05 bayonet. 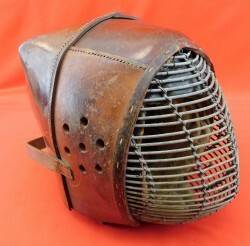 This example was built by Simson & Co. This Kris shows a 14" traditional blade in well preserved condition. Wood carved Garuda Bird grip. This piece is mounted in a wood, leather covered straight sheath.